Bowhead whale near Verlegenhuken, 2009. Beschreibung: The Bowhead whale, sometimes also called Greenland whale, is a large, dark animal up to 20 metres long and 100 tons in weight. The mighty mouth alone can occupy a good third of the body length. The baleen plates that hang down from the upper jaw, can be three or even four metres long, the longest of any whale species on Earth. Bowhead whales are slow swimmers, with a strong, V-shaped blow. The most important diagnostic feature is the absence of a dorsal fin. Distribution / Migration: The Bowhead whale is a high-arctic whale species that tends to stay near drift ice. Both historical observations and some scarce modern data seem to indicate that the Bowhead whale spends the winter far north, between 78 and 80°N, but the summer further south (70-73°N). They have been extremely abundant well into the 17th century, but have been driven close to extinction by whalers during subsequent decades. In recent years, single Bowhead whales have been seen again in Svalbard waters. During the summer of 2006, one animal was even seen near Longyearbyen – the first sighting of this species on the west coast of Spitsbergen for a very long time and thus quite a sensation! In 2007, five Bowhead whales were seen south of Kvitøya, and individual animals were also observed more recently, mostly on the north coast. Nevertheless, the Bowhead whale must unfortunately be considered practically extinct in the area, and nobody is able to say if the population will ever recover. There are still a few hundred animals in the Russian and north American Arctic. Recent data suggest a slight recovery of the West Greenland population. Biology: Little is known about this extremely rare species. Like other baleen whales, Bowhead whales swim slowly through surface waters of the oceans, filtering immense volumes of seawater for plankton. A cow may give birth to a 3.5 metre long calf every second year. Miscellaneous: The fine oil that was boiled out of the blubber (=fat) layer was a precious product, as was the baleen. This made the Bowhead whale the preferred target species of a very intense, international whaling period in the north Atlantic during the 17th and 18th centuries. In Spitsbergen, the species was protected in 1911, but internationally, this happened as late as 1939 – far too late, obviously. 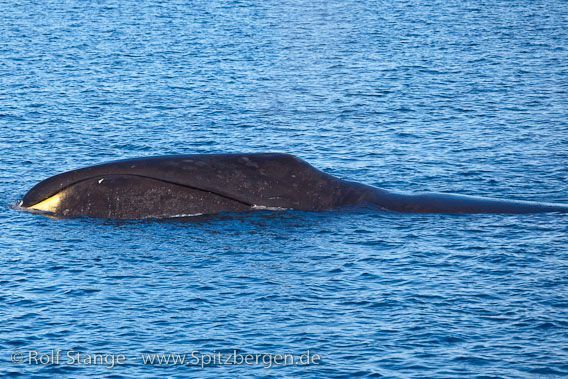 Today, it is hard to imagine the abundance of whales that must have crowded the fjords of Spitsbergen in the past. Old chronicles and logs can give only a slight idea.